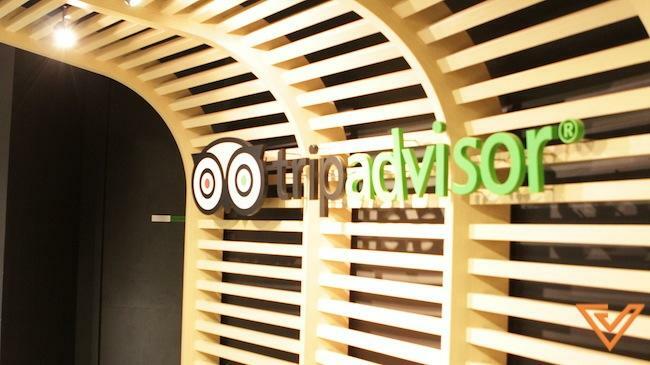 TripAdvisor has announced its top contributors of 2014, based on the reviews and opinions submitted on TripAdvisor from its community of millions of travellers worldwide. It seems that Singapore has come out on top, this time as some of TripAdvisor’s top contributors. The online travel platform now features more than 200 million reviews and opinions from its global travel community, covering more than 4.4 million businesses and properties in 145,000 destinations. 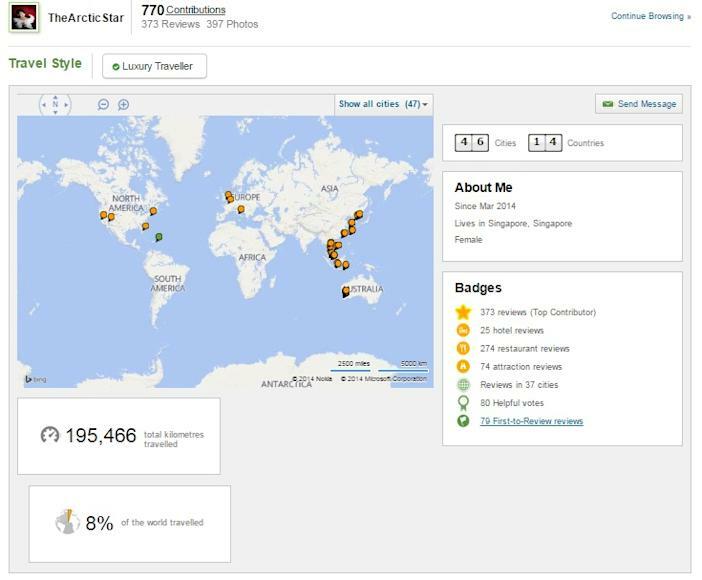 In its latest release, it highlighted its top contributing members and countries, as well as the most-reviewed cities, accommodations, restaurants and attractions on the site in 2014, based on traveller contributions made to TripAdvisor from January to September 2014. Among the top contributing countries in 2014, Singapore is ranked first in the highest number of words per review, as well as the highest percentage of international reviews (reviews for travel outside of a member’s home country). It seems like Singapore takes to crowd-reviewing sites like TripAdvisor like a fish to water. 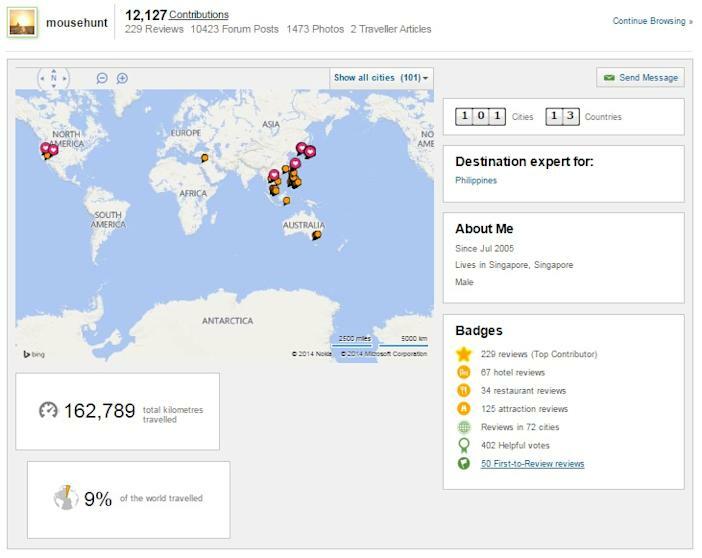 These are some of the most prolific TripAdvisor contributors from Singapore in 2014. 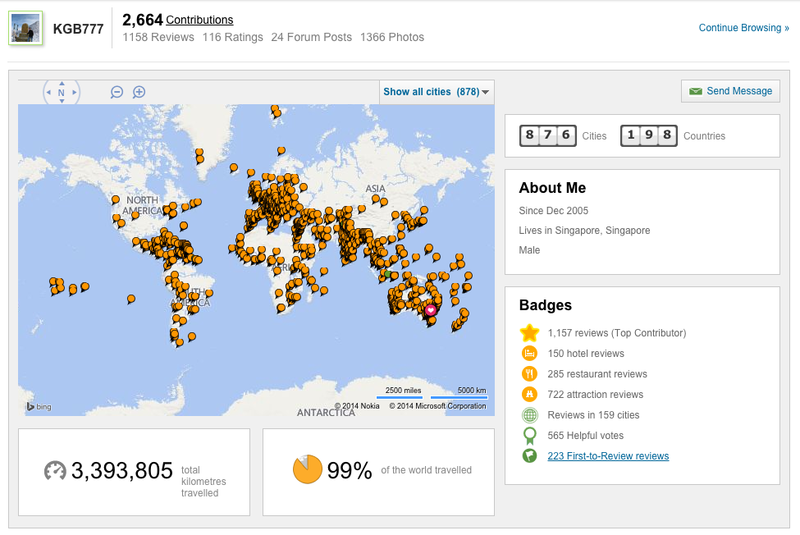 Singapore’s top contributor with the most reviews is KGB777, with 602 reviews in 2014. An expatriate living in Singapore for eight years, KGB777 has travelled all around the world. He started using TripAdvisor more actively in 2012 as a way to log his personal journeys. Amazingly, KGB777 has a record of 99% of the world travelled and written about! Singapore’s top contributor with the most restaurant reviews is TheArcticStar, Elle L., with 228 restaurant reviews in 2014. A Singaporean entrepreneur, and evidently a foodie, Elle has travelled to more than 12 countries in the Asia Pacific region. Singapore’s top contributor with the most content and forum posts is mousehunt, with 2,040 pieces of content and 1,830 forum posts in 2014. A lifelong travel enthusiast, mousehunt started using the TripAdvisor Forums in 2005 to seek advice for his travels. Today, he is a Destination Expert for the Philippines, providing guidance to travellers on a daily basis. TripAdvisor also announced the most popular Singapore places on its platform. While Facebook has announced that Universal Studios Singapore is the most checked-in location in Singapore, it seems that this isn’t the case on TripAdvisor. The post Singaporeans Are Wordy Travellers, Among Top Contributors On TripAdvisor appeared first on Vulcan Post.